We all want to make the most of our time. Sometimes it feels like it is going by so quickly, and often can seem that we have nothing to show for it. No one wants to waste time but often it can be difficult to manage our time wisely. 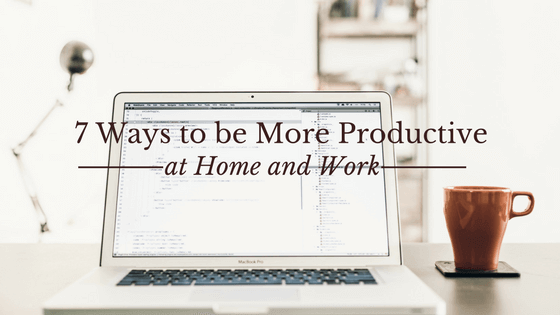 Here are some principles that will help you to become more productive, whether at home or at work. Everyone has a different requirement for how much sleep they need, but the one thing we all have in common is that we do not function at our best unless we are getting that necessary amount. It is suggested that adults need between 7 -9 hours a night. Try to find your sweet spot as far as how much is best for you, and make it a priority to get that sleep. If you don’t know where you want to go, how are you going to get there? Set goals to guide you where you want to be. Also, don’t try and “eat the whole elephant at once.” Break those goals up into small chunks and conquer them bit by bit. For example, if you are trying to tidy your home, go from room to room rather than trying to take on everything at once. If you have a project at the office, do a few things every day in order to complete it by the deadline. Our bodies function well when we work on a daily routine. There is no need to be boxed in by a rigid schedule, but if you loosely follow a certain pattern each day you will find that it leads to greater productivity. Keep the space around you tidy. Make this a priority. When you live in chaos, it can be a distraction, making it almost impossible to accomplish anything. On the other hand, a clean and orderly home and office contribute to clarity of mind, which will increase your productivity. No matter how many people feel that multi-tasking is a positive and necessary trait, it is actually counter-productive to getting anything of value done. You may think you are making good use of your time by multi-tasking, but it actually makes it impossible to focus on anything fully and lessens the quality of your work. Complete one thing well, before moving on to the next task. Trying to complete 5 different things at once means you aren’t concentrating on any of them properly. An important aspect of being productive is taking care of the body you live in. Make time for exercise, as it releases natural “feel good” chemicals which will give your day a boost and provide you with a positive outlook. Eat right and be sure to drink plenty of water, as this will give you the energy you need to make the most of every minute. Don’t skip meals, as it affects your concentration when you’re hungry, making tasks more difficult than they need to be. And make sure you add some rest time into your day, even if its just going to get a glass of water every hour, allowing your body to stretch and your mind to clear. None of us has time for everything. As much as we try to get everything done, sometimes there simply are not enough hours in a day. Make a To Do List of what needs to be done and decide what is most important, what is least important, and what falls in between. You might have many good things on your list, but you need to decide what is not only good, but the best for you personally. With everyone so busy and with so much that we want to fit into our busy schedules, it is important to be able to make the most of each moment. Start putting these tips into practice and watch your productivity grow.